Diary Of A Madman (1963): Is You Is Or Is You Ain't a Horror Movie? Imagined mid-1962 conversation between Vincent Price and American-International co-chief Samuel K. Arkoff: VP: Hey Sam, even though my contract with AIP is non-exclusive, I did want to stop by and let you know that I'm starting a new picture for Eddie Small. SKA: That's swell, Vince. You'll recall, however, that our contract prohibits your doing outside films along horror lines. VP: Oh no, Sam. This is based on a story by Guy de Maupassant. A fine literary adaptation. 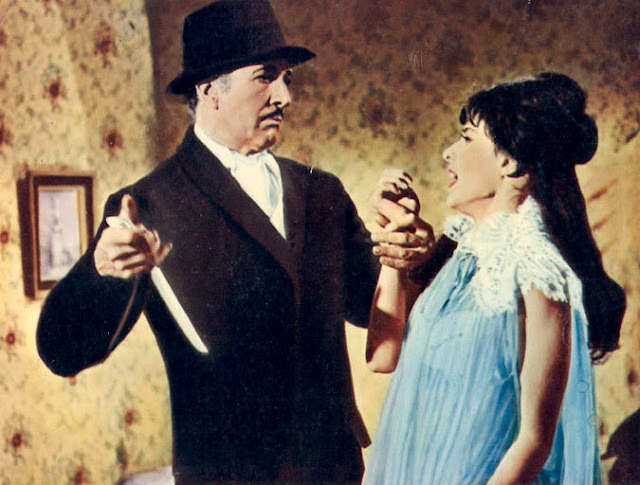 SKA: Our Poe movies are fine literary adaptations too, but they're still horror movies. What's this one about? VP: Well, it's about a man who is driven to murder by a malignant ghost. SKA: Gee, Vince. That sure sounds like a horror picture to me. By the way, what's the title? VP: de Maupassant's story is "The Horla," but they're calling it Diary Of A Madman. SKA: (shakes his head) Vince, Vince, Vince ... VP: After all, Sam, what else are people going to hire me for ... you want me to be happy, don't you? SKA: Alright, Vince, go ahead. But you know the damned thing will play across every street from our next Poe picture. VP: Thanks, Sam. But I'll be sure to emphasize to everyone that this is a gothic melodrama, not a horror movie. SKA: Sure thing, Vince. Here's luck. Diary Of A Madman came on TCM recently. I had never seen more of it than a trailer at our Starlight Drive-In in July 1965. 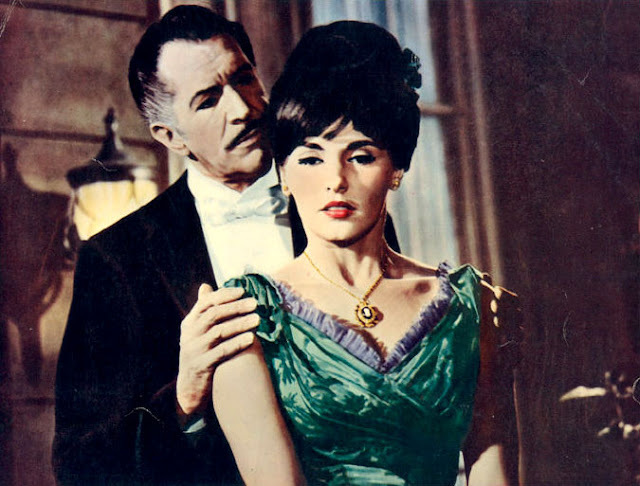 My mother, bless her, had driven me, a sister, several cousins, there to see Brides Of Dracula and The Haunted Palace. It was my summer dream come true, despite our having to leave before the third feature, Curse Of The Werewolf, unspooled. Enough was enough, after all. Here's how pervasive monsters were at the time: the moment we got home, around 11:30, I begged to stay up further for The Black Room, about to start on Channel 3's Horror Theatre, hosted by Dr. Evil. Could you blame parent concern for such overdose? 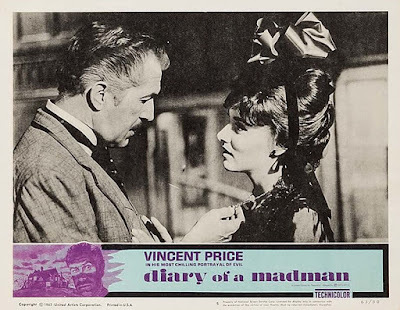 It's as well I didn't return to the Starlight the following week, for what a stiff Diary Of A Madman was/is, Price an only reason to watch, even him not equal to task of keeping me awake through TCM's broadcast. I'd guess VP went into this with high hope, at a time when anything other than further AIP chilling would be an oasis. There had been effort at bending the mold, though we at the time scratched heads over Confessions Of An Opium Eater, the title suggesting opium was lethal, or at the least indigestible, but what was opium? To Price's immature following, a more apt label might have been Confessions Of A Toadstool Eater, or Confessions Of A Rat Poison Eater. Either way, this was an easy one to pass. I've still never looked at it. 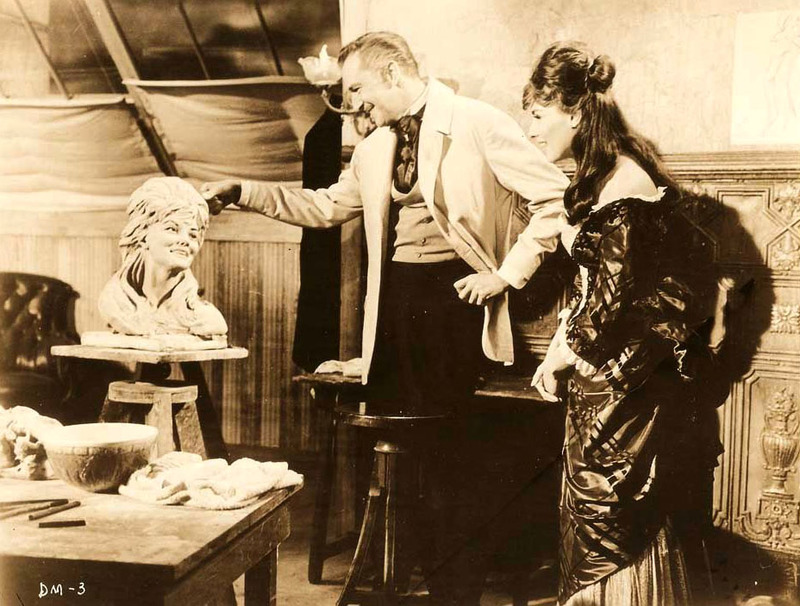 Edward Small was reliable supplier to United Artists of copycat cheapies that fed off popular trends. His Jack The Giant Killer aped Columbia's hit The Seventh Voyage Of Sinbad, and got Ed sued for the lift. Diary Of A Madman was nothing if not effort to re-strike lightning from the Poes and past occasion where Price did mad sculpting (House Of Wax). If the film wasn't precisely cut to horror's measure, at least selling could remove doubt ("The Most Terrifying Motion Picture Ever Created," so there!). From promise like that, Diary Of A Madman must have let down a lot of people. Under Reginald Le Borg direction (he of The Black Sleep and Inner Sanctums), Price and players move from one room to another at endless swap of talk, the "Horla" merely a human voice that can also tip over chairs and spill ink. To further upset of that, as in red ink, Diary Of A Madman went wanting through 1963 dates as tandem with Amazons Of Rome. Domestic rentals of $365,118, plus foreign at $363K, might have broken it even, assuming Small held fast to budget, though there wouldn't have been much, if any, profit, to spread around. Did Price have a percentage? --- if not, he probably took around the same Jim and Sam had been paying, $50K or upward. 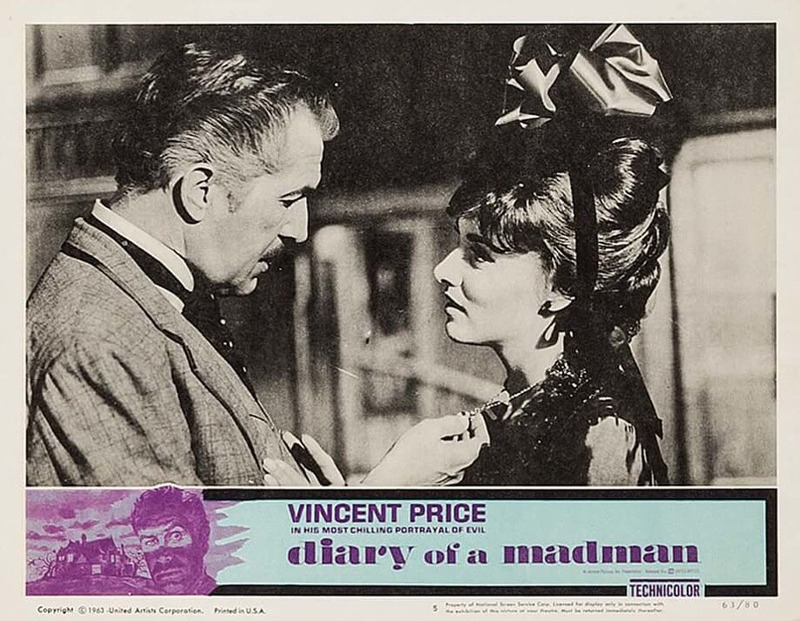 Diary Of A Madman is available as an On-Demand DVD from MGM. I saw this on the TCM schedule and TCM On demand/Sling and made a point to avoid it. Like Twice-Told Tales from the same year, it felt like it was trying to grab the AIP Poe audience while being "better." Both have a feel of just going through the motions. You should check out "Confessions of an Opium Eater" - I rather enjoyed it as an eccentric little VP picture. That imaginary conversation was pretty funny, but I have a hard time picturing Vincent Price saying "Hey." I recognized Small's name from a handful of excellent if slightly thrifty looking swashbucklers: COUNT OF MONTE CRISTO (my favorite version), MAN IN THE IRON MASK (James Whale's), THE CORSICAN BROTHERS (Fairbanks Jr. times two), and SON OF MONTE CRISTO (a fun pastiche of several non-Cristo swashbucklers). His Wikipedia entry includes a long filmography and, more intriguingly, a list of films he announced but never made. JACK THE GIANT KILLER deserves points for sheer moxie, momentarily swinging a couple of limp skeletons on wires at Jack and showing them as fighting on the posters. It was burdened by a slightly off-key screenplay connecting the effects set pieces; Harryhausen and Schneer were always careful about having decent scripts. Many times when I see an old advert here, an advert that has the theater's address, I go to Google Earth to see what's there now. However, 99% of the time the theater does not print it's address. 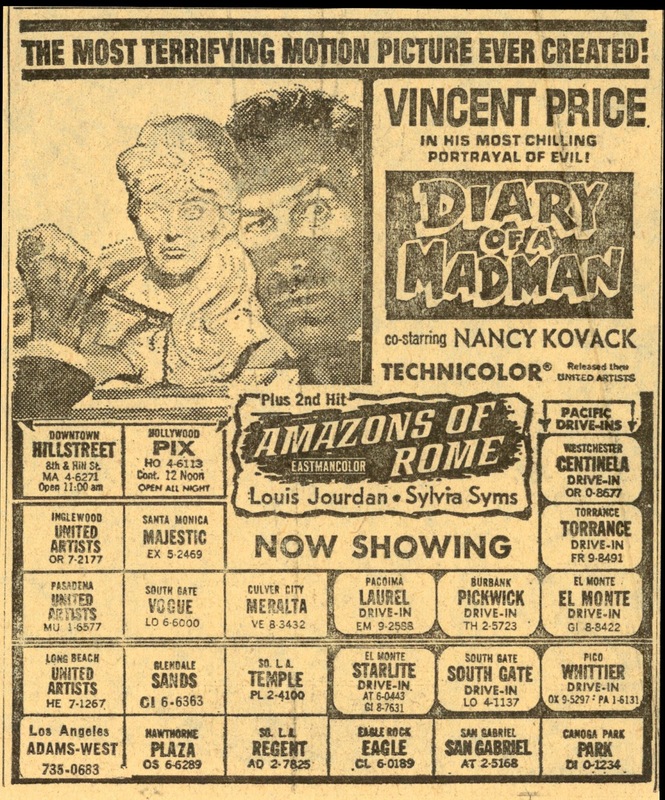 The advertisers assumed everyone knew where their local theaters were located. I do that very often, but you're right, there are times when it's impossible to determine the theatre's location. Having read THE CONFESSIONS OF AN OPIUM EATER I looked forward to the film. What we get is "Thomas de Quincy lived in London. I, Gilbert de Quincy live in San Francisco." The film is straight down hill from there. 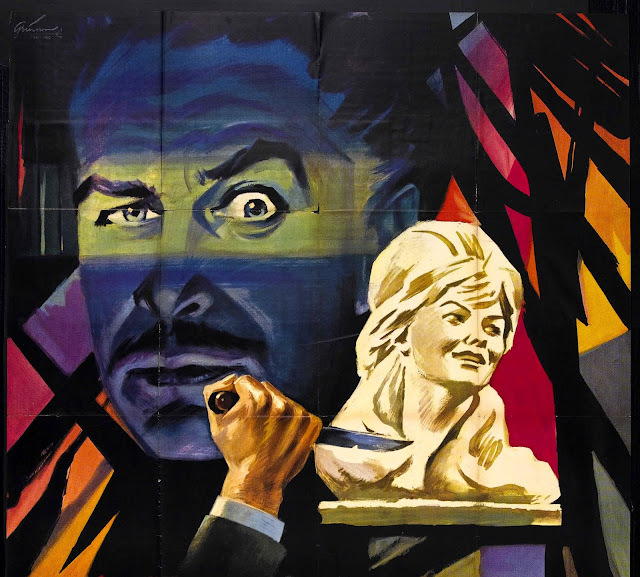 John, the film is also available on Blu-ray in one of the Vincent Price sets that Shout Factory put out. Looks quite a bit better there than the MGM MOD. I like the film a bit better than you, though it is one of Price's weaker movies to be sure. Had forgotten all about that Blu-Ray, Jim, and I think that set is around here somewhere, unwatched as with so much that comes out in these prolific times of HD releasing. I'd need three more lifetimes to catch up with all of good stuff so far made available. 'Tis a Golden Era we're living in.